Donovan Bailey is a retired world class sprinter from Canada, who has held the world record for his gold medal performance in the 1996 Olympic Games in the 100 meters race category. He was also the first ever Canadian to legally break the “10 second barrier” in a 100 meter race. He is most widely renowned for his top speed, which was recorded at an astounding 27.07 mph (12.10 m/s) in his 1996 Olympic title run, the fastest at the time. Consequently in 2005, for his services and achievements, he was inducted into the Ontario Sports Hall of Fame. 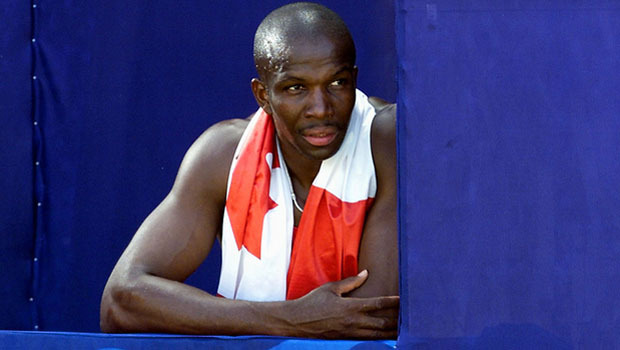 Donovan Bailey was born in Manchester Parish, Jamaica on December 16, 1967. However in 1981, when he was 13 years old he emigrated to Ontario, Canada to live with his father. He consequently attended Queen Elizabeth Park High School in Oakville, Ontario. During this time, Bailey made a place for himself on the track team in his high school, and ran his first 100-metre dash in 10.65 sec, at the age of 16. However, he did not pursue running seriously, instead choosing to spend more of his time focusing on basketball. To his credit, he played forward on the basketball school team at Sheridan College, Oakville, where he was studying economics at the time. Upon his graduation, Bailey proceeded to start his own marketing and investment consulting business, while still occasionally dabbling in sprinting. 1991 saw him winning the 60-metre dash at the Ontario indoor championships. As he was not training professionally, Bailey was unable to make the Canadian national track team for either the 1991 world championships or the 1992 Olympics. Bailey proceeded to become a part of the Canadian national track team in 1993, after he caught the attention of coach Dan Pfaff, who invited Bailey to train with him and subsequently overhauled his technique and polished his style, allowing Bailey to hit greater speed while sprinting and sustain it. Following this, Bailey took part in the 1995 world Track & Field Championships in Gothenburg, Sweden, where was successful in winning both the 100m sprint and the 4 x 100 m relay titles. He also broke the indoor 50 m world record (being timed at 5.56 seconds) during a competition in Reno, Nevada in 1996 which was serving as a precursor to the centennial Olympics that were to be held in Atlanta. He also repeated the “double” at the 1996 Atlanta Olympics, successfully setting a world record of 9.84s + 0.7 m/s win in the 100 meters race. Following Carl Lewis, Donovan Bailey was the second person in history to hold all the major titles in the 100 meters category concurrently (World Champion, Olympic Champion & World Record Holder). All these victories made Bailey to become the embodiment of hope for the Canadian people that restored the tarnished reputation of Canadian athletes in international competitions. Bailey was successful in securing a third world title in 1997 with the Canadian relay team, however only finished second, falling behind Maurice Greene in the 100 meter race. Disaster struck for Bailey when at the height of his career following the 1997 season, he ended up rupturing his Achilles tendon, which effectively ended his career. He tried to make a second attempt to return in the 2000 Summer Olympics for a shot at Olympic glory, but ended up suffering from pneumonia and had to drop out during the initial rounds. As a result, in 2001 Bailey officially retired from the sport, spanning a career that saw him become a three-time World and the 2 time Olympic champion. Following his retirement, Bailey started his own company called DBX Sport Management, which aims at helping amateur athletes find a way to promote themselves. He has also started a sport injury clinic in Oakville, Ontario. He was officially inducted into Canada’s Sports Hall of Fame on two occasions: as an individual in 2004, and as part of the 1996 Summer Olympics 4×100 relay team in 2008. He has four brothers and is currently the divorced father of two children.